You’ve just made a pot of your favourite spaghetti sauce and everyone loved it. Cleaning up the mess it made on your stove backsplash doesn’t have to be a chore. Here are some cleaning tips that will have your kitchen looking sparkling clean again in a flash! Use a mild detergent in warm water and a soft cloth to clean up grease, grime or other dirt. Wipe dry with a clean cloth to avoid water spots. Use a solution of 1 cup water, 1 cup rubbing alcohol and 1 tbsp of vinegar to give the surface a beautiful shine. Stove panels can be tough to clean as they are small and have areas that are hard to reach. Use a cotton swab dipped in soapy water to clean and remove dirt in and behind the knobs. Plastic knobs get a lot of use, so don’t be afraid to use a little elbow grease when cleaning them. Use a textured sponge and dish detergent to clean up any stubborn or caked on stains. Due to its durability, plastics can be washed with any general household cleaning product. Stainless steel surfaces are prone to showing fingerprints and smudges so regular maintenance is important. Use a stainless steel or glass cleaner to keep them looking clear and shiny. Remember to wipe in the same direction as the grain. Use a mild detergent or dish soap and warm water to wipe down stainless steel surfaces. Be sure to wipe dry with a soft cloth immediately to avoid water streaks or spots. 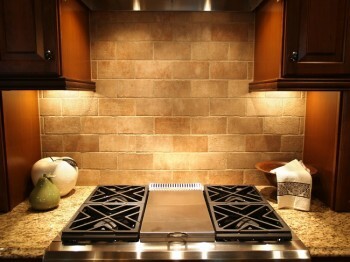 Cleaning your stove backsplash regularly will keep your appliances looking good as new and easier to maintain. For more information on their inventory of appliances and recommended appliance cleaners, visit Appliance Scratch & Dent Outlet at www.scratchanddent.ca.